Organization with style has never been so easy. This metal rail with hooks allows for easy access to frequently used items such as hand towels, potholders and kitchen utensils. This sleek design maximizes unused space between your counter tops and cabinets. Embrace the Liberty of organization! Achieve a combination of functional and upscale appearance with the Liberty 35 lb. Satin Nickel Ball-End Coat and Hat Hook. The smooth ball ends are perfect for hanging your coats, hats, robes, towels and more. And the round tapered base makes this a perfect hook to install anywhere extra storage is needed. Contempo Pilltop Hook Bedford Nickel Organization with style has never been so easy. This metal hook is designed to hold a wide variety of items coats, hats, handbags, umbrellas, towels or robes. This classic design is perfectly suited for any room from the entryway to the bathroom. 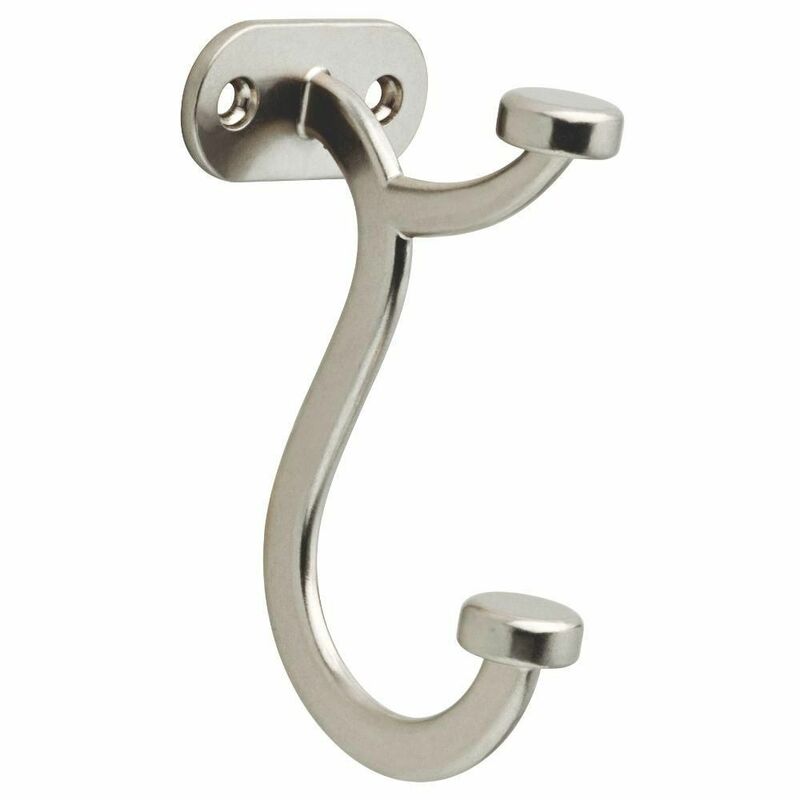 Contempo Pilltop Hook Bedford Nickel is rated 4.9 out of 5 by 7. Rated 5 out of 5 by jjulie from Beautiful hooks I purchased these to recycle a book shelf into a coat hook. Regular hooks touched the shelf making them useless. This kind of reverse hook look works. Rated 5 out of 5 by Anonymous from Look great Ordered six of these hooks for our mudroom and they look great. They are substantial and sturdy, and the bottom curved hook is perfect for the kids' backpacks. Rated 5 out of 5 by Mike from nice looking not flimsy hooks As per the picture, the hooks have a nice weight to them, they don't look like a heavy coat will bend them. Good hook, good value. Rated 5 out of 5 by floridanative from Love these hooks! We put these up in a hall in our condo at the beach so everyone has a place to hang their damp towels (beach and bath). They know what to do when they come in and cuts WAY down on big loads of laundry. No more single use towels! Planning to put beadboard behind them soon to protect the wall, then swimsuits will dry there as well. Rated 5 out of 5 by ModernHistory from Great hooks Very happy with these hooks, as they do a good job of fitting in with both the modern and historical aspects of our home. They are well made and the way the hooks are designed make it easy to hang all types of coats, hats, and jackets. I would definitely recommend these.